Photos by by Izabella Dubielczyk ©by Izabella Dubielczyk 2003; all rights reserved. 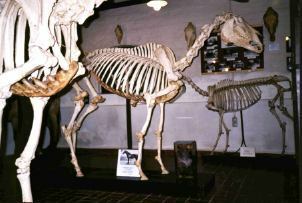 Skeleton of Dark Ronald, located in the Julius Kuhn museum at the Martin Luther-Universitat Halle, Wittenberg, Germany. DARK RONALD sired some good horses in England, and was later sold to the national stud of Germany at Graditz, where he took up stud duties in 1914. There, he became a highly influential sire, heading the sire's list five times. In 1919-20 the thoroughbreds in the national stud were moved to Altefeld, which is where Dark Ronald stood, along side Ard Patrick (to 1923), and Nuage. He was sent to Halle/Saale at the end of the '20s, and was euthanized at the University there in 1928. His skeleton was mounted, his heart preserved, and his skin tanned. -- I.D.